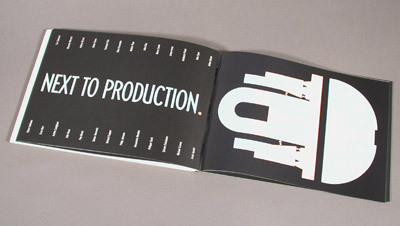 The cover is silk-screened on chip board and the typeface used is from a traditional letterpress printing shop. The five different papers used were vellum, coated, uncoated, linen, and a silvery gray. Two views of a fold-out tray are printed on vellum. The photos in the catalog are all black and white but the effect is always different depending on which paper they are printed on. Opening spread for the section devoted to the upcoming ideas and product prototypes displayed at the show. Not in Production. Exhibit catalog. Alessi, Milan, Italy. 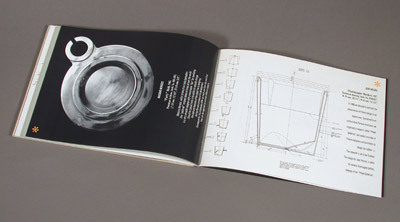 This catalog was designed for the first show to be held in the gallery space above Alessi's Milan showroom. 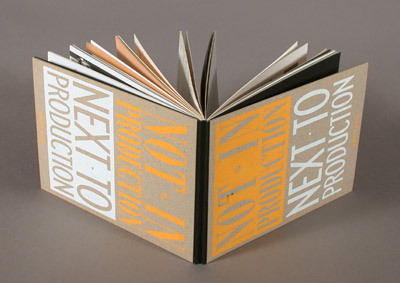 The full title of the show: Not in Production - Next in production, reflects the eclectic materials exhibited. Never-produced items were displayed alongside upcoming ideas for the future. 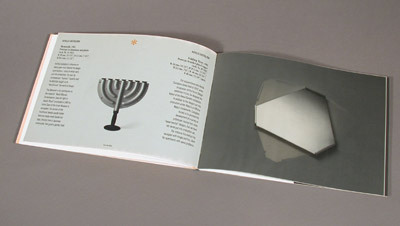 The catalog uses five different kinds of paper and was assembled partly by hand. Designed with Mauro Panzeri (grafco3.com). Product photography by Mauro Masera.